The American Scream debuts tonight on Chiller at 8 p.m. Eastern. Actor turned director Michael Stephenson was able to simultaneously exorcise childhood demons and establish himself as a funny, empathetic, and assured filmmaker with 2010’s Best Worst Movie, his wonderful documentary about the curious, comitragic afterlife of Troll 2, the famously (or rather infamously) terrible B-movie in which Stephenson starred as a young boy. Like the simpatico American Movie, Best Worst Movie is a big-hearted valentine to the admirable human impulse to create regardless of circumstances, a goofy but strangely touching exploration of outsider art at its most unself-conscious and gleefully deranged. The same can be said of Stephenson’s follow-up to Best Worst Movie, The American Scream, a Chiller TV feature-length documentary about “house haunters,” obsessives who transform ordinary suburban homes into insanely elaborate haunted houses every Halloween. The film chronicles several haunted-house proprietors but focuses on Victor Bariteau, a laid-off white-collar worker who tests the patience and indulgence of his family every Halloween by mounting, at his own expense and with an automatic expiration date, an impossibly lavish haunted-house in his home. The outside world can be scary and grim—and not in a spooky, ooky, haunted-house kind of way—but in his morbid obsession, Bariteau has created a world of his own devising where he controls everything. Being the architect, craftsman, and God of his own haunted house affords Bariteau a sense of power he cannot hope to attain in the business world. Bariteau’s fixation puts his family in a strange place: it occupies so much of his time and energy that they need to share his madness, to one extent or another, just to feel part of his world. Halloween is something the whole family shares but it’s not as if they ultimately have any choice in the matter. Making a gruesome spectacle of Halloween every year similarly serves to bind a hulking father-son team of Rick and Matt Brodeur. In this instance, the generational dynamic is reversed: the son is the Halloween fanatic whose life revolves around his homemade haunted house while the father humors his son’s obsession as a way of being close to him. The house haunter’s lives revolve around Halloween so the holiday’s passing understandably leaves them feeling more than a little melancholy. Stephenson waits until the final act to reveal the underlying cause of Bariteau’s pathological fixation with Halloween. He was raised Branch Davidian and consequently didn’t celebrate any holidays, let along dedicate every stray moment of his life to celebrating Halloween in the most flamboyantly public manner imaginable. For Bariteau, transforming his modest home into a spook factory every October provides him an opportunity to experience as an adult the macabre joy he was purposefully denied by his family as an impressionable child. He consequently goes from one extreme to another, from being the boy forbidden to celebrate Christmas and Halloween (which may not be the worst trauma in the world but cannot have been any fun at all) to the weird Halloween guy. This development explains an awful lot, if not everything, but Stephenson drops it in so late and in such a manipulative fashion that it feels a little like dime-store Freudianism. The American Scream has a built-in climax where months of painstaking and passionate planning, preparation, and homemade craftsmanship pay off in the smiles and shrieks of dozens of children the haunted house proprietors will probably never see again—at least until the next Halloween comes around. The film gleans a distinct poignancy in the inherently ephemeral nature of the house haunter’s overriding, soul-consuming passion. By definition, they throw their time and energy and financial and emotional resources in spooky Brigadoons that pop up magically Halloween season then hibernate until the next year. The American Scream can be breezy to a fault. In its weakest moments it can feel like a super-sized human interest story (who are these civic-minded weirdoes who welcome strangers into their private domicile of horrors every Halloween?) but the film has plenty of subtle, ingratiating strengths, not the least of which is providing a permanent, indelible record of its subject’s deeply personal labors of love. Needless to say, house haunting appears to be an overwhelmingly—if not exclusively—male field, for reasons you can probably imagine. 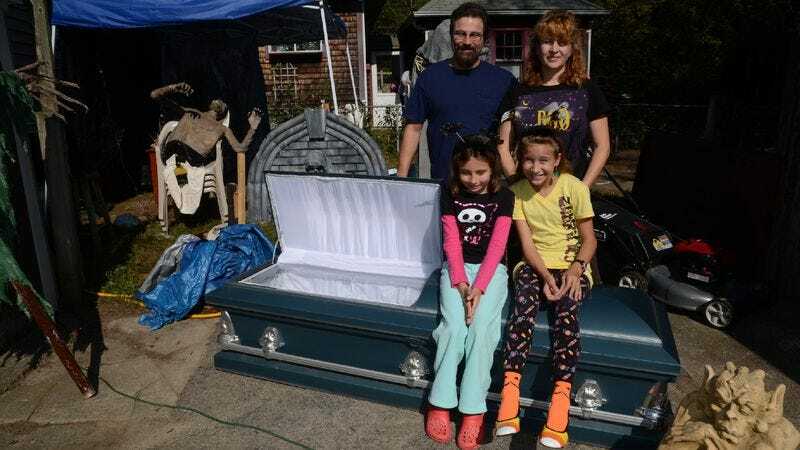 Nonetheless, it is poignant seeing that Bariteau’s daughters tried to get into the Halloween spirit as a way of connecting with their dad. The film ends with passionate amateur Bariteau going pro by setting up a professional haunted house. I wish him well. It takes a lot of courage and chutzpah to follow your dreams that way.